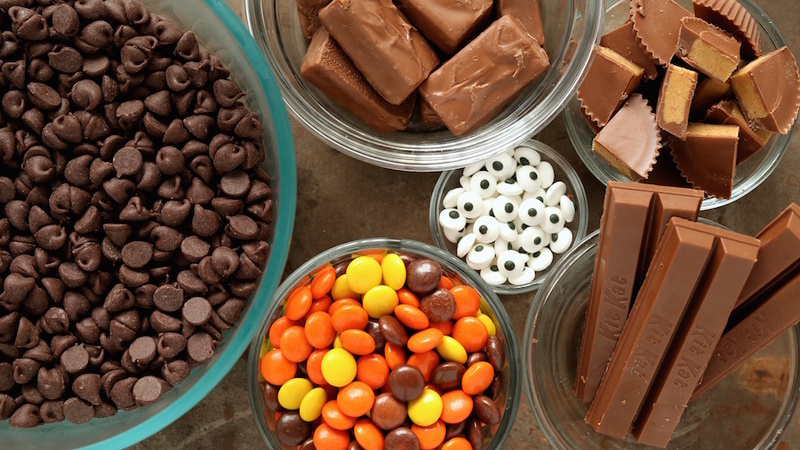 It’s Halloween season and you know what that means: candy on candy on candy! And this recipe is literally just that. 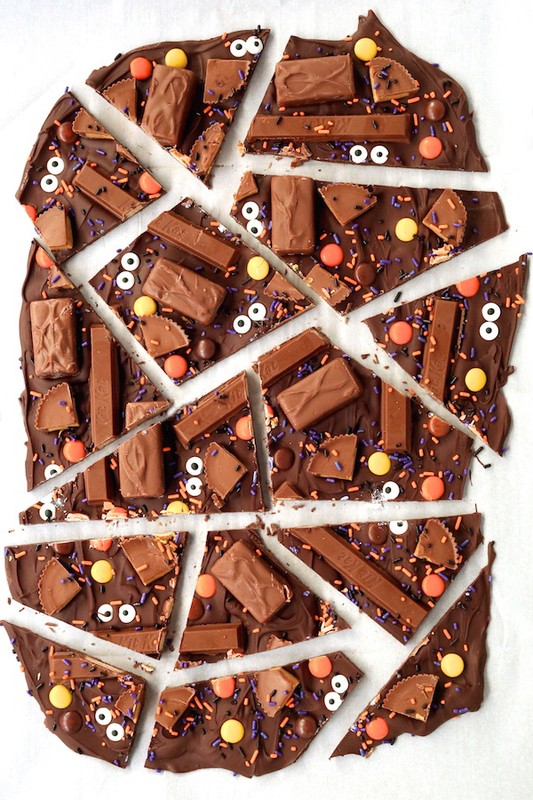 If you’re looking for a super simple, no-bake Halloween dessert, this is it! I melted the chocolate in the microwave (much easier/faster than the stovetop) and then just pressed my favorite Halloween candies into the top. I imagine kids would have a blast helping out with this one. Feel free to use whatever candy you prefer. I think it would be really good to add in something salty like pretzel sticks to balance out the sweet. Melt the chocolate in the microwave. Microwave in a microwave-safe bowl for 1 minute. Stir and continue microwaving in 30-second increments until completely melted. Pour melted chocolate on to a baking sheet lined with parchment paper. Spread with a spatula until about 1/4″ thick. Top with Halloween candies. 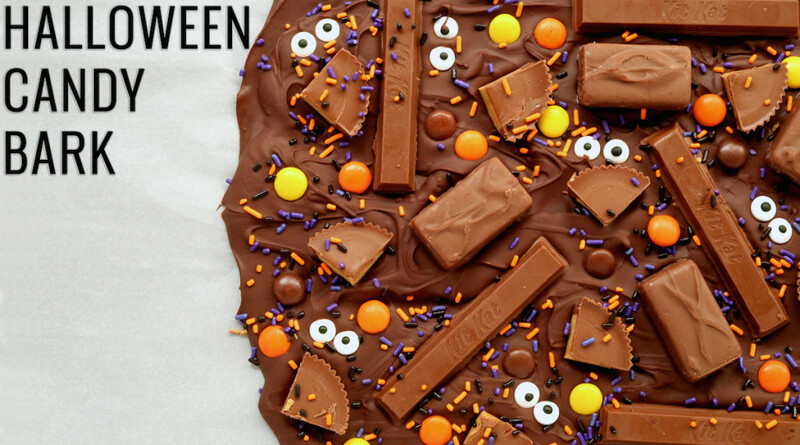 Set in fridge and cool for about 30-45 minutes until chocolate is hard and candy is set. Cut into irregular shapes. Serve immediately. Store leftovers in an air-tight container. Love this! 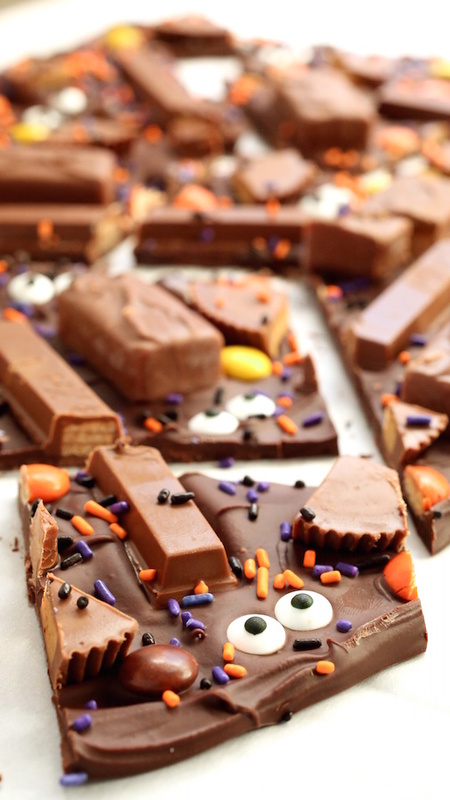 So cute and perfect for our Halloween get-togethers! Loved this. I changed mine up a bit, as I wanted a little ‘something more’ and used semi-sweet and added to it, cinnamon, salt, chipotle powder and espresso powder and swirled it with white chocolate tinted in orange. Used M&M’s, reese’s, butterfinger and dark chocolate covered pomegranate seeds. It was pretty delicious. Kristin, that sounds amazing! I will have to try it when I make another batch. Love the idea of the pomegranate.